Any Two Cards can truly win or lose the game. 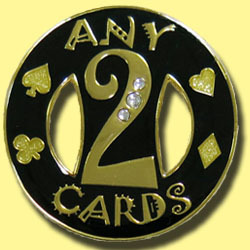 This spinner is 45 mm wide, is black and gold, has three diamond crystal stones wedged in the arc of the number two, has four gold glitter colored symbols for the club, heart, diamond and spade, two cut outs, and raised gold-colored wording. The spinner on the back side is the same quality as all our custom spinners.